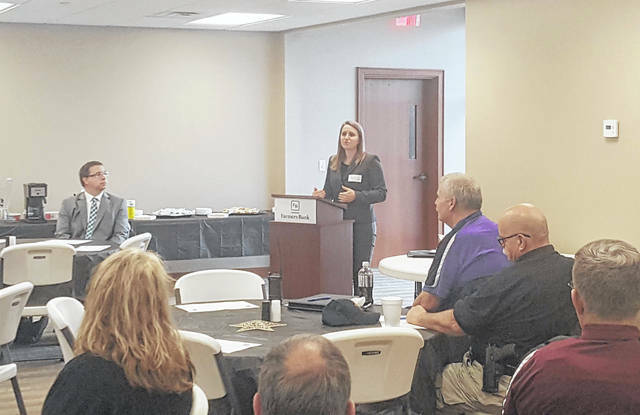 Elizabeth Well, Ohio Crime Victim Justice Center Legal Director, speaks about Marsy’s Law during the Partners For Justice meeting and luncheon on Friday. 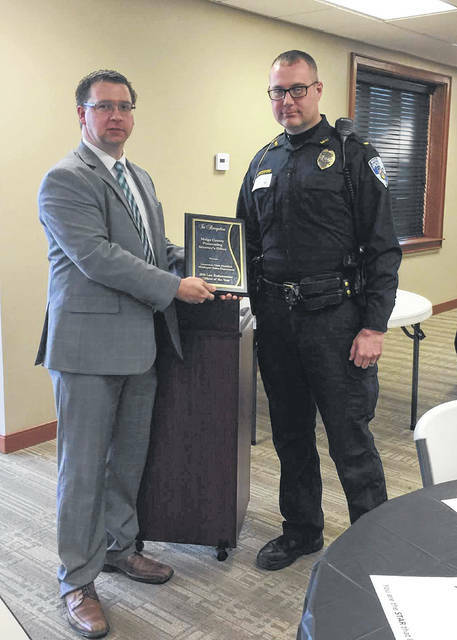 Lt. Chris Pitchford of the Middleport Police Department is presented the Officer of the Year Award by Meigs County Prosecutor James K. Stanley during Friday’s Partners For Justice meeting and luncheon. POMEROY — Numerous individuals from agencies across Meigs County came together on Friday for the first meeting of the Partners for Justice program. Organized by the Meigs County Prosecutor James K. Stanley and Victim Assistance Director Theda Petrasko, along with their staff members, the goal of the program is to better serve the victims of crime in the county. In welcoming those in attendance, Stanley noted that the idea for Partners for Justice began last year when Petrasko came back from a conference with the idea to put together a group of partner agencies to be sure that there are no gaps in the services provided to victims of crime. While the initial idea was to serve victims of domestic violence, the program is planning to reach all victims of crime in the county. Explaining why a group such as Partners for Justice is important, Stanley stated that the law change, particularly following the passage of Marsy’s Law, and that it is important for all agencies to be on the same page. With the first meeting as a large group, Stanley noted he hopes to form a smaller “round-table” group which will meet on a regularly scheduled basis. The program will allow for the group to “talk about what we are doing right and what failed to ensure that we do not repeat those failures,” said Stanley. It will also allow for the various agencies to know what services other agencies offer in regards to what may help victims of crime. Also addressing the court was a domestic violence survivor. She spoke of the six months of violence she endured and how things would be worse each time she would call to report to crime. When the offender would be released from custody, he would be back at the residence without any notification or warning to her. She noted that there needs to be a better way of notification to keep the victims safe from the abuser and to hold the abuser accountable. The final speaker of the day was Elizabeth Well, the Legal Director for the Ohio Crime Victim Justice Center. The Ohio Crime Victim Justice Center is a state-wide non-profit which serves victims of crime. Well spoke about the changes to the law regarding victims after the passage of Marsy’s Law. The constitutional amendment was passed in 2017 and went into effect in February 2018. The law provides several rights to victims, as well as defining what a victim is under the law. More specific information regarding Marsy’s Law can be found on the Ohio Crime Victim Justice Center website at https://ocvjc.org/marsys-law . After the speakers, Stanley presented the Meigs County Office of the Year Award to Lt. Chris Pitchford of the Middleport Police Department. In presenting the award, Stanley stated that Pitchford brings a lot of drug cases for prosecution, as well as helps to serve the victims of crimes.